Why will people throw gold into the street? Home/Mailbag/Why will people throw gold into the street? QUESTION: Can you think of a reason why people will be/would be throwing their gold and silver into the streets? Ez. 7:19 – too dangerous to own or perhaps guilt over how they obtained it? ANSWER: There is no reason that people would literally throw gold and silver into the street and there is no evidence that people ever have, even when under siege. Had they literally thrown their precious metals into the street the Babylonians would have been obliged to scoop it up. The prophecy simply indicates that valuables would not be of any use. After all, the Babylonians came for the express purpose of plundering Jerusalem of its treasure, particularly the gold that was used in the temple utensils. The record in Daniel indicates that long after the Chaldeans had sacked Jerusalem they were drinking from golden vessels they had plundered. The Jewish historian, Josephus, reported that during the siege of Jerusalem by the Romans hundreds of Jews surrendered to the Romans, but when it was found out that some of them had swallowed gold in order to smuggle it out in their bodies the Roman soldiers began cutting them open while they were alive to check for ingested treasure! The point is, when God brings judgment upon his people there is no way he can be bought off. As for any modern fulfillment it should be noted that the people living during the centuries that the Bible was written were not acquainted with paper money. Although bartering was common for thousands of years gold and silver have been the primary medium of exchange. So, gold and silver were synonymous with money. The evolution of paper money, at least in Europe, started sometime back around the 1400’s. Banks were in operation that stored gold for their wealthy clients. In return the depositor would receive a receipt – a certificate worth the amount of gold they had on deposit. Eventually, the certificates themselves began to be exchanged, while the gold on deposit did not exchange hands. Over time bankers began loaning out the gold they had on deposit and only kept a small fraction in reserve, and the certificates became currency. This was the beginning of what is called today, fractional reserve banking. Even up until quite recently paper money was backed by gold, and coins were actually made of nearly pure silver. It wasn’t until the post WWII Bretton Woods agreement was dissolved in 1971 that the U.S. Dollar became decoupled from gold backing. Now even gold itself is mostly traded electronically, through ETF’s (exchange traded funds) and derivatives, while the real metal is kept in the vault. However, while bankers have waged a war against gold for decades, considering it a barbaric relic, and while traders trade paper gold in the virtual world, it is interesting to note that Russia and China and India, the key BRICS members, have been buying the yellow metal by the ton and taking delivery. The bankers surely know the whole financial and monetary system is a gigantic fraud and at some point must come crashing down. And there is no question that a new system in the planning. To be sure, it is not as though there are not small scale historical precedents for money to become worthless. The most well-known instance was in the aftermath of the First World War when the Versailles Treaty imposed impossible war reparations on Germany. In order to meet the demands Germany merely began printing enormous amounts of money with no gold backing. For a few years it seemed as though prosperity had returned to vanquished Germans. But then hyperinflation began. But the presses kept printing Reichsmark bank notes in increasingly larger denominations. And the more they printed the faster the Reichsmark depreciated. Over the span of a few months it became worth less and less until it became worthless. In the end the only value the money had was the paper it was printed on. 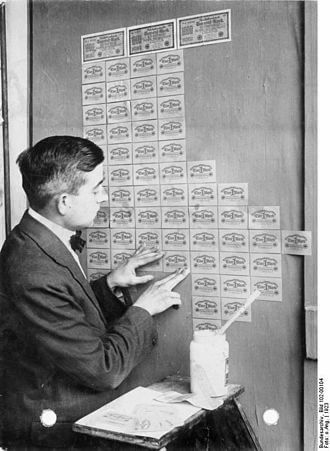 Some Germans used bundles of Reichsmarks for fuel. Others used it as wallpaper. 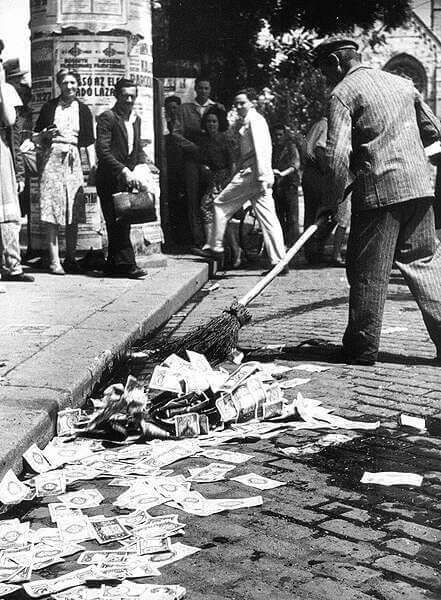 Others literally threw their worthless money into the street. Of course, the collapse of the Reichsmark was a local phenomenon that injured Germany primarily. What the prophecies are foretelling is going to be global. After all, the U.S. Dollar is the world’s reserve currency, so if it goes into hyperinflation, which is inevitable considering the rate at which it is being printed, then, obviously, the whole system will be impacted. But as far as the prophecy is concerned, today most people do not own physical gold and silver. And it is certainly not used as money. But nearly everyone is tied into the virtual and paper money system. It is that system that is going to fail in the near future. Whereas, the prophets spoke of God’s people throwing their gold into the streets, James says that “your gold and silver have rusted away.” This is obviously hyperbole, as gold is considered rustproof. That is one of the reasons it is so highly prized as a metal. For instance ships carrying gold have sunk in storms or in warfare hundreds of years ago, and although the ship itself may rust or rot away the gold remains untarnished by the elements. So, again, the Scriptures are not literally saying that gold and silver are going to rust, but that what we value materially, specifically what may be valued as money, will become worthless during the last days. In this instance the gold and silver may be literal. What might this portend for the future? In the span of one generation America went from being the world’s biggest creditor to the world’s biggest debtor. The biggest lender to the U.S. Treasury is the Federal Reserve Bank, which is actually a privately owned corporation that was adopted as a federal agency in 1913. (See the book The Creature from Jekyll Island, which was one of the first books I read when I started off down conspiracy road back about 20 years ago.) The Fed bank buys U.S. treasury debt – T bills – by simply creating a ledger entry – creating money out of nothing. No one really knows how indebted the Federal Reserve is since it has never been audited. But it doesn’t take a great deal of imagination to consider a plausible scenario in the future when the global financial system fails and the trillions of trillions of derivatives come due. In all probability the huge too-big-to-fail banks will foreclose on every private debtor, including mortgage holders and sovereign debtors. The Federal Reserve Bank will require the U.S. Treasury to redeem the trillions of debt it holds, probably requiring the seizure of all the gold held in Fort Knox. Likely too, control over food production and distribution will be seized by bankers. In that situation money will become worthless. In the aftermath a new system will be imposed upon the world and no one will be able to buy or sell outside the system. More than likely private ownership of gold will be prohibited and confiscated. Just as the plundering of Jerusalem by the Babylonians and later by the Romans was a judgment from God, so too, the coming crash of the system will initiate the ultimate judgment from on high – the day of Jehovah.